Is it a family comedy or is it a horror? For those who grew up in the 1980s, it doesn't matter. 1984 Topps Gremlins trading cards captures one of the most memorable films of the decade with a standard approach that's both simple and memorable. Taking care of a Mogwai and looking after your trading cards have a lot in common. Both should never be exposed to bright light. Getting water on them is definitely not advisable. Feeding them after midnight? Well, if you can feed your cards, you've got bigger issues. The 1984 Topps Gremlins checklist features 82 base cards. Apparently, storing cards in nine-pocket pages wasn't a thing back then. It jumps right into the story, recapping key points and recreating popular moments. Cards also do a good job at fleshing out Billy, Gizmo, Kate and other key characters with the occasional promo shot. Concept art even makes an appearance on a couple of cards. The design is bright an instantly recognizable. Card fronts have a bright yellow border that gives way to a jagged frame. Most images are stills taken from the film. The bottom corner has an icon of either Gizmo or the Gremlin version of Stripe. 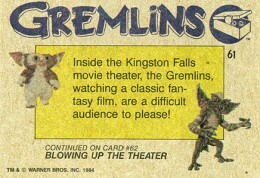 Card backs have the Gremlins logo running as a headline across the top. A yellow box in the middle has Gizmo and Stripe on opposite sides. Write-ups are a mix of quotes, trivia and plot summaries. Every pack also comes with one of 11 stickers. While the die-cut images and thick colored borders are common of Topps sets from the era, the busy backgrounds are a little different. Behind sticker images are stripes of the Gremlins key art. Sticker backs can be used to make a Gizmo puzzle. 1984 Topps Gremlins cards remain relatively easy to find and affordable today. Full sets with stickers can usually be found for under $20. Boxes come with 36 packs, each with ten cards and one sticker. Rack packs of 45 cards were also produced. 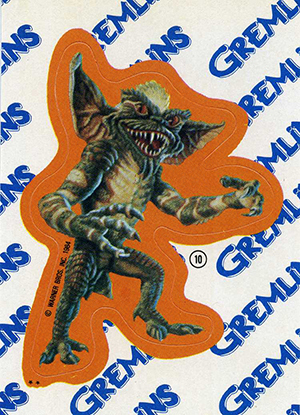 Besides the trading cards, Topps also produced a set of Gremlins album stickers. 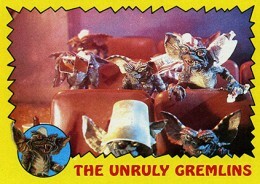 They also produced a set of cards for the 1990 sequel, Gremlins 2: The New Batch. 1984 TOPPS GREMLINS RACK PACK, , 45 CARDS, WARNER BROS.
26 Friend ... or Foe? 39 "Stay Away or I'll Spray!" 55 Saved by a Flash! 57 Along for the Ride! 59 "The Gremlins Are Inside!" 63 One Gremlin to Go ...! 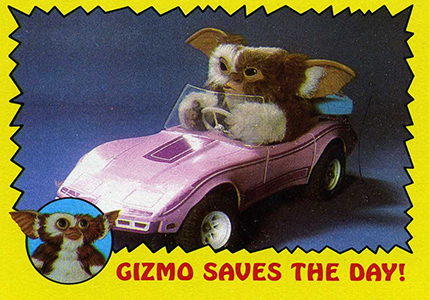 69 Gizmo Saves the Day! 71 The Good Guys Triumph! 11 cards. Inserted one per pack. Image border color noted. 1984 Topps Gremlins High Grade Complete Set (1-82) w Sticker Set (1-11) !!!! 1984 TOPPS GREMLINS TRADING CARDS COMPLETE SET 1-82 + ALL 11 STICKER CARDS! I have 4 1984 Tops Gremlins cardboard trading cards #9,22,61,45. How much are they together or apart? 1984 Topps GREMLINS Movie Trading Photo Cards X-Out Box of (36) Packs! 1984 Topps Gremlins Full Box 36 Mint Packs Original Stock NO Stickers Variation!